Posted 12-2-2015 by Sherrel Stewart. What should school children be taught about Islam? In Southern states such as Florida and North Carolina, parents claim students are being “indoctrinated” with a sanitized version of the Muslim faith. One of the fiercest fights so far is going on right now in Tennessee, possibly revealing the playbook for future battles. For the Southern Education Desk, Chas Sisk of WPLN reports. Usama Dakdok, a traveling speaker, addressed an overflow crowd of about 300 people recently at the Christian Life First Assembly of God in the small, Middle Tennessee town of Sparta. Dakdok, using a fire-and-brimstone delivery, preached about the dangers of Islam. The military campaigns of Mohammad, the crusades and the 9/11 are all proof Muslims are violent, says the Egyptian-born Christian. Dakdok was referring to the world history textbooks being used by seventh graders in rural White County and many other Tennessee districts. He claims those books are part of plot, similar to how schools have tricked kids into believing in the theory of evolution. “When you do nothing, you’re going to lose your children,” he says. The famed Scopes monkey trial on evolution took place only 50 miles down the road from Sparta. And just like that case, this fight over Islam isn’t only about how to educate a few school children or even several classrooms. It’s a demonstration of how hard religious conservatives are willing to fight to keep out ideas they believe are dangerous. 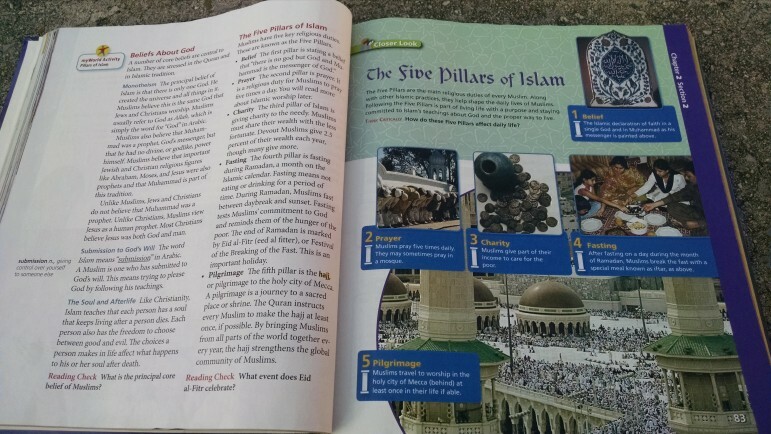 This textbook is used by some Tennessee Schools to teach students about Islam. Foes of the textbooks have called for the White County School Board to resign. They’ve threatened to picket businesses. They’ve even run radio ads calling school board members out by name. It’s not just White County. Many other districts, including several in suburban Nashville, have been confronted by claims of pro-Islam bias. Vicki Kirk, Tennessee’s deputy education commissioner, says the study of religion is different from becoming or adopting a belief. She believes it’s a good idea to teach kids early about Islam. “We have so many students in Tennessee that rarely go outside the borders of their hometown. Let’s say I wanted to be a missionary. It would be pretty important for me to know a little bit about other cultures if I was going to go live in one,” she says. But Kirk understands why it’s a sensitive subject. She is a former middle school science teacher. “I did teach things that some students found objectionable, and I said, you know, we’re going to talk about what science has to say about this. But you have your beliefs, and nobody’s treading on that,” she says. Education officials have agreed to start revising the standards in January. They hope that’ll take some of the heat off local school districts. A panel of teachers will revise the curriculum. That will lead to a rewrite of the textbooks. Three weeks after the anti-textbook rally, the White County School Board held its next meeting. A local sheriff’s deputy stood watch as about 70 people entered. Almost all turned out to be supporters of the textbooks. Deanna Lack says those who are calling for the books’ removal are acting out of fear. “I think, we need to not villianize a whole group of people because of the actions of a few,” she says. The crowd’s support seemed to embolden the school board. One by one, members said they would not send the textbooks back. For that stance, they were given a standing ovation. School Board Chairman Edd Cantrell was emotional after the meeting. The Southern Education Desk is supported by a grant from the Corporation for Public Broadcasting. Civil Rights, Voter ID laws, Felon Rights. These topics aren’t foreign for teachers and students in Southern classrooms. But what happens when pressure to teach to the test prevents challenging conversations? In Mississippi, the Civil War still stirs emotions. It’s not so much that teachers disagree on how it should be taught, but that ongoing attempts by the University of Mississippi and several cities across the South to shed Confederate symbols have called up old ghosts. Sandra Knispel reports for the Southern Education Desk.